This week, we’re looking at Donald Maas’ Writing the Breakout Novel Workbook. My goal is to inspire and educate you to the basics of writing, and hopefully help you find resources to enhance your writing. Yesterday, we looked at Lessons 1-12, Part I, Character Development from Donald Maas. The lessons covered everything from adding heroic qualities to a protagonist (the one we root for), to antagonists, to enriching the major cast with secondary characters. I listed one point from each, and encouraged you to acquire this workbook and complete the fill-in exercises at the end of each lesson to help you grow your novel. 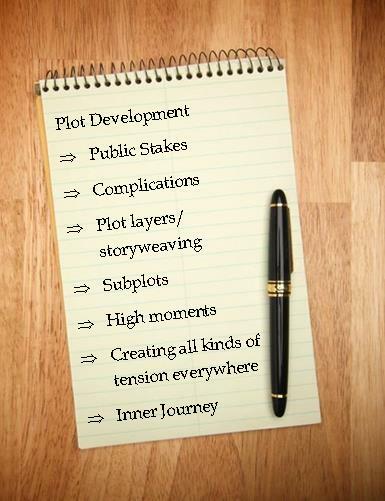 Today – I’ll be listing the lessons from Plot Development with a “nugget” from each. This unit covers Lessons 13 to 24, everything from raising the stakes, complications, layering plot lines, subplots, turning points, conflict, and adding tension. Lesson 13 – Public Stakes: Murphy’s Law is in effect here. What can go wrong? As a writer, think of every possible disaster and use as many as possible against the protagonist. Lesson 14 – Complications: Arising from conflict, make your hero/heroine face major problems on their way to achieving their goal. Obstacles force them to overcome. Lesson 16 – Weaving a Story: Connecting the various plot lines (not subplots, plot lines) that seem different and unique, bringing them together to enrich the reader’s experience. Lesson 17 – Subplots: Subplots are what happens to the secondary characters, as they are woven into the main story. There can be several but they should not overtake the main plot, although they might try. Lesson 18 – Turning Points: The point at which things change. It can be new information, a shift in events, a reversal, a loss, a twist, a challenge, or a disaster. Make your turning points more powerful. Lesson 19 – the Inner Journey: the hero’s inner turning point, self-perception shows him where he is now. They come to a realization about themselves, this allows them to change and grow. Lesson 20 – High Moments: You catch your breath and wonder what just happened. Story high moments are breathtaking, forgiveness, death, direction turns, self-sacrifice, and moral choices. Lesson 21 – Bridging Conflict: Not what you think. It’s setting up the main action of the story by creating anticipation and making the reader want to find out what is going to happen. Lesson 22 – Low Tension Part I – The Problem with Tea: Keep tension in your scenes, even the ones that are seemingly benign type parlor, kitchen, or living room settings with tea and coffee. Lesson 23 – Low Tension Part II – Burdensome Backstory: Dole it out in pieces throughout the novel, don’t info dump in the first couple of chapters. Not knowing everything adds tension. Lesson 24 – Low Tension Part III – Tension on Every Page: Disagreements, taut and simmering dialogue, friction in feelings. All these can assist in making every scene sizzle with tension. We’ve now completed two-thirds of the notebook. Many passages from literary works are used to illustrate the main points each lesson has. 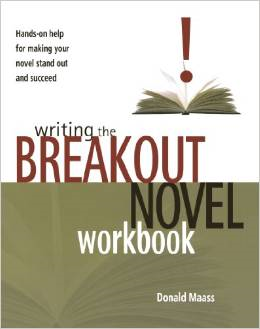 Exercises at the end help you make your novel on of breakout quality. How’s your story coming along, if you’re writing one? If not, why not? Leave a comment and let me know.